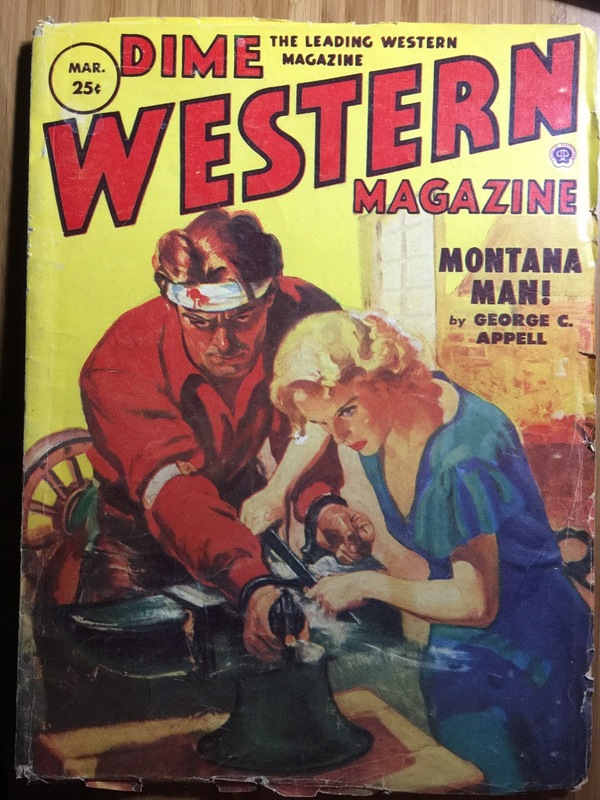 I recently got my hands on this issue of Dime Western, at a rather reasonable price too. and was quite happy with that purchase. 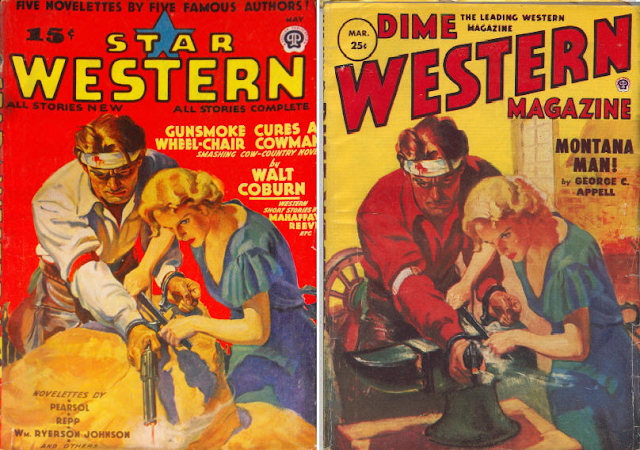 From the cover, it looks quite ordinary, just like any other issue of Dime Western from the period. 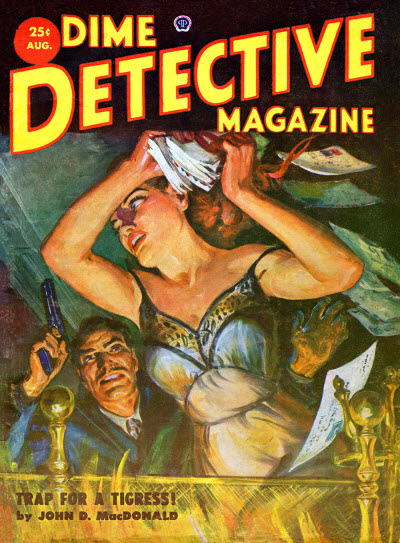 After 9 more issues, the magazine would stop publication. There are actually two points of interest about this particular issue, though. The first, and more well known is that this is the issue in which Elmore Leonard's story, 3:10 to Yuma, first appeared in print. The story is quite short (around 4,500 words). Anyway, the other interesting point about this issue, to me at least, is the cover. When i saw it, I was reminded of another cover, and i went looking for it. Here it is, changed from the Star Western May 1939 issue. I wonder if the original artist was asked to make the changes. 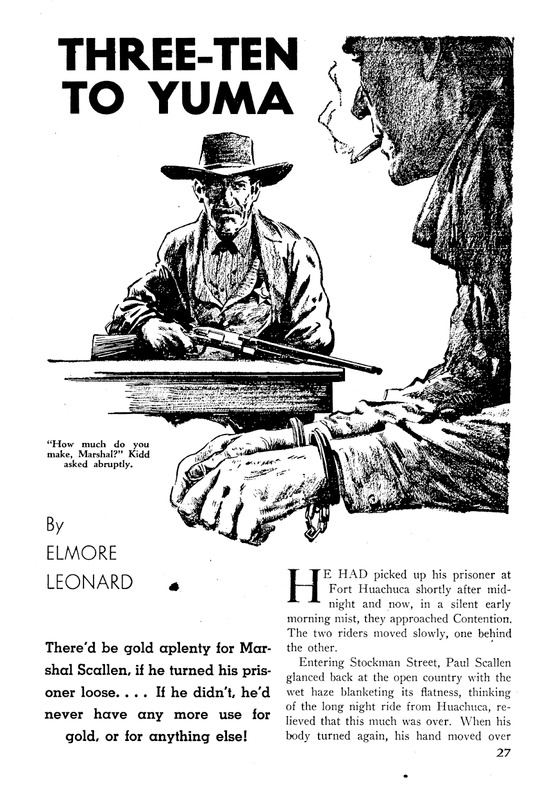 There has been some research conducted into the readership of the pulps, notably Erin A. Smith’s Hard-Boiled: Working-Class Readers and Pulp Magazines. In that spirit, with tongue firmly in cheek, I offer you this composite portrait of the readership of Dime Detective, based on the ads I saw in the magazine during my review of three issues from the 1930s, 40s and 50s. Lots of rare high grade magazines up for auction, including a complete run of Excitement. Full catalog here. The is the last in the series of 3 reviews of Dime Detective from the 1930s, 40s and 50s. 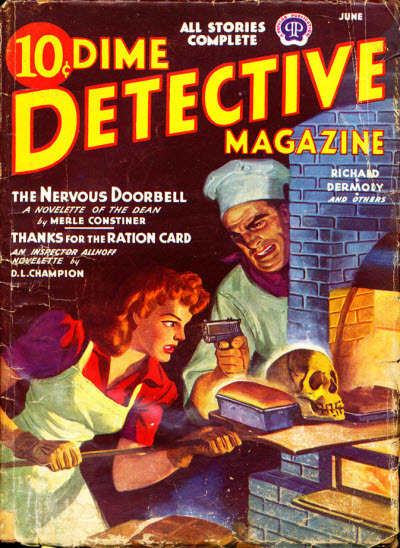 Dime Detective, along with the rest of the pulps, was struggling financially in the 50s. You can see this from the absence of big names from the issue and the inclusion of a reprint from 1941. There were 16 pages of ads (including the covers), so you were only getting 90 pages of new fiction for your quarter. Even accounting for the difference in paper sizes, you got more for your money from a contemporary paperback. Having said that, it’s still a good issue. Interior illustrations are uncredited and unsigned, no idea who did them. This is the second in a series of three reviews of Dime Detective magazine issues from the 1930s, 40s and 50s. Cover artist uncredited, cover is unsigned.